Accessible only by dirt road, Young is one of Arizona’s most beautiful undiscovered treasures. 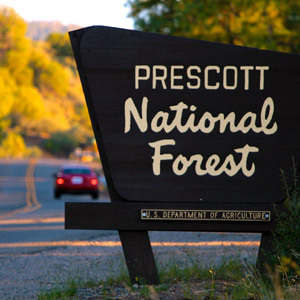 Completely surrounded by the nearly three-million-acre Tonto National Forest, with pine-forested slopes, spring-fed creeks, and box canyons, the quiet town makes an excellent base for hiking. The park ranges in altitude from 1,300 to 7,900 feet, and is safe to explore not only during the warm months, but in winter, too. For information about Tonto National Park, visit this station. They have information about trails and local fauna and flora. Anglers can also try their luck for trout at Haigler Creek. The cantina sits perched on a hill with amazing valley views, and serves a menu of simple-but-yummy Mexican dishes (tacos, enchiladas). The 10 spare rooms are clean and comfortable, with fridges and fireplaces—and are set right near some of the area’s best hiking spots.